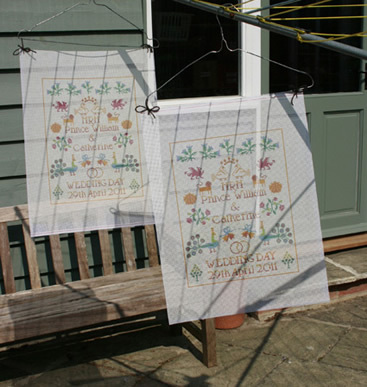 On special occasions (and the Royal Wedding was a very Special Occasion) I print my own designs onto needlepoint canvas. This requires a spending time in my rather spidery shed, usually on a Sunday morning while listening to The Archers omnibus – which helps me to forget the spiders. The Royal Wedding sampler is a cross-stitch design but it translates perfectly onto canvas so when requested, I print them to order for customers who prefer printed canvas needlepoint. The technique requires heat under pressure and this slightly affects the colour of the canvas which takes on a rather pleasant ‘antique’ appearance. It will all be stitched over anyway – but an afternoon in the sunshine restored these canvases almost back to the original sparkling white. Thanks to those gloriously sunny days we had in April!